Are you Asking: Should I Declaw my Indoor Cat? Should I declaw my indoor cat? To declaw or not to declaw, that is the question. I think most all cat owners already know that if your cat is an outdoor cat or even an indoor/outdoor cat, kitty needs their claws for hunting and self-defense. However, back to my question, should I declaw my indoor cat? Most vets will always advise against this procedure. Therefore, when you ask yourself, why should I declaw my cat? Let us be realistic, it is somewhat barbaric. However, what if you have an animal that is literally doing thousands of dollars’ worth of damage to your home and property that declawing would solve? What do you do if you have to make a heart-rending decision, whether your pet can stay with you or if you need to find a new home for your cat? My cats are family. They are loving, affectionate members of my family and they bring me lots of joy. Maybe you are like me. Maybe you have more pictures on your phone of your feline family than you do of your kids. We all understand how hard it is when you are at that point and you ask yourself the question, should I declaw my indoor cat or why should I declaw my cat. At Love Our Cats, we are not here to judge or to tell you what to do about your fluff ball or what not to do with your fluff ball. We want to give you information, share stories, get YOUR opinions and be a place for cat health information. I have had my pets declawed before. 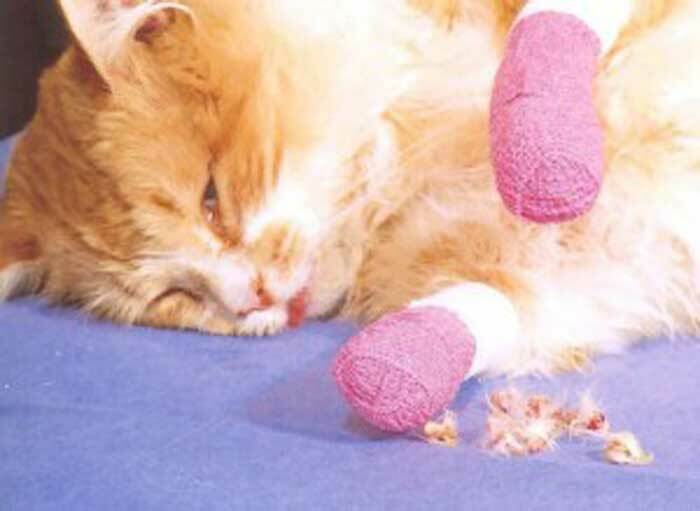 When I heard that declawing takes a digit down to the first knuckle, I was horrified! That cannot be true! I saw for myself that the claw was gone with just a stitch or two at the end of the digit. Was I wrong? You can see it is true, it is a horrible procedure that none of us would EVER want to go through so why would we consider it for our animals. However, at the same time, what can we do to keep our cats from turning out couches inside out, our screens into ribbons or rugs into cotton balls? I will tell you what worked for me and then PLEASE, if you have found things that have worked for you, share them here with our community! First, keep your cat’s nails trimmed. You may end up with shredded skin to match your curtains so ask someone for help in holding the animal. If you do not have that brave friend, wrap a beach towel around your cat similar to a baby letting one paw out at a time. Carefully trim the nail to a blunt end being careful not to trim too deep towards the quick. Try to take your time, give kitty lots of praise and many calming words as you do it and then do it often. If you make it part of your routine, your cat will not be so freaked. Secondly, it is STILL in your fur ball’s nature to want to groom themselves so they will probably keep trying to sharpen their claws. What has worked tremendously for me and several others are sisal posts! It has the PERFECT texture that cats seem to love to use. I have one hanging on the door where my cats like to watch birds and then one “couch high” post that I can move around the room. I watched to see where the kitties liked to scratch and then moved the post right in front of the place. Oh, sure, they will still drag themselves on the carpet from time to time – especially when they want a belly rub but the sisal post has been a lifesaver (or should I say a CAT saver)! Finally, I bought a cat tower with two more sisal posts and put it in a favorite place for them to watch the world. It has become a ritual before they start climbing to sharpen their claws on the post before they climb. I am happy to report that we are ALL happy now. Check out our TOP 10 cat tree reviews to see the best trees in both the (Standard) and (Premium) categories. These trees will save your furniture and give kitties a place to play and relax too. I have seen other items on the market…cat nail filers, cat nail tips and more. If those have worked for you, let us know! The reviews I have read and the people I have talked to have given them mixed reviews but if it saves a kitty from going through the declawing surgery, consider it! Back to the original question, should I declaw my indoor cat’? Please, please do not! Consider some of our suggestions. Talk to other cat owners to see what has worked for them. At the very least, talk to your vet. Thanks for listening to my story! Now share yours below!